Welcome back to the last day of our Blenders Blog Hop. We hope you've enjoyed seeing our blender lines--Burlap, Blush, and Fleurish, specifically--showcased in fun and easy tutorials! These blenders work beautifully on their own, as you've seen this week, and they also coordinate nicely with your favorite prints. 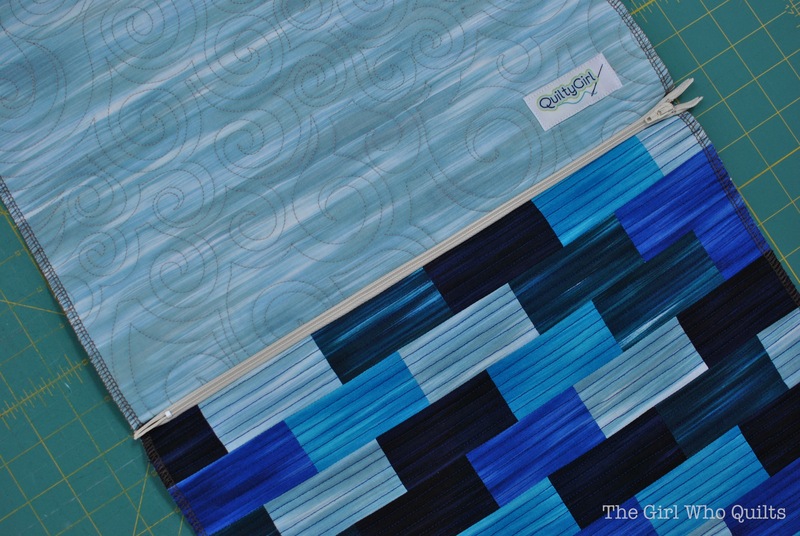 Today, Nikki from The Girl Who Quilts is sharing her subway tile design pillow using the Fleurish collection from Kanvas. After scrolling through her tutorial, head over to her blog to see how you can enter for a chance to win a fat quarter bundle of Fleurish for yourself. Hi! 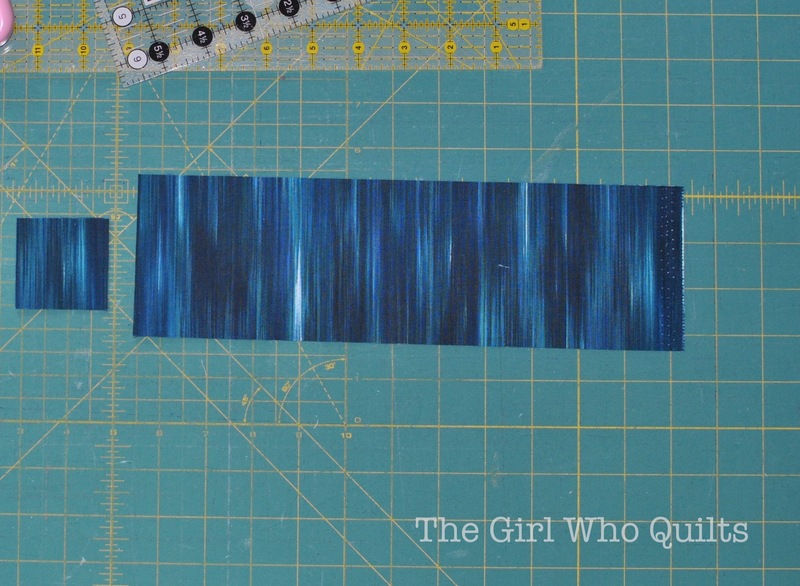 I'm Nikki from The Girl Who Quilts! 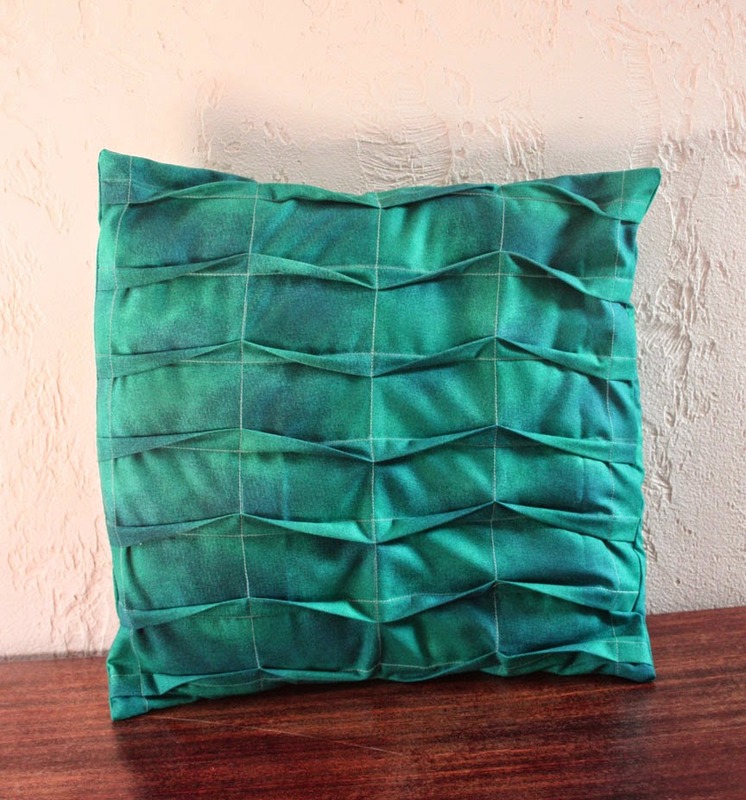 I have a fun tutorial using the Fleurish blenders to create a pillow based on subway tile. 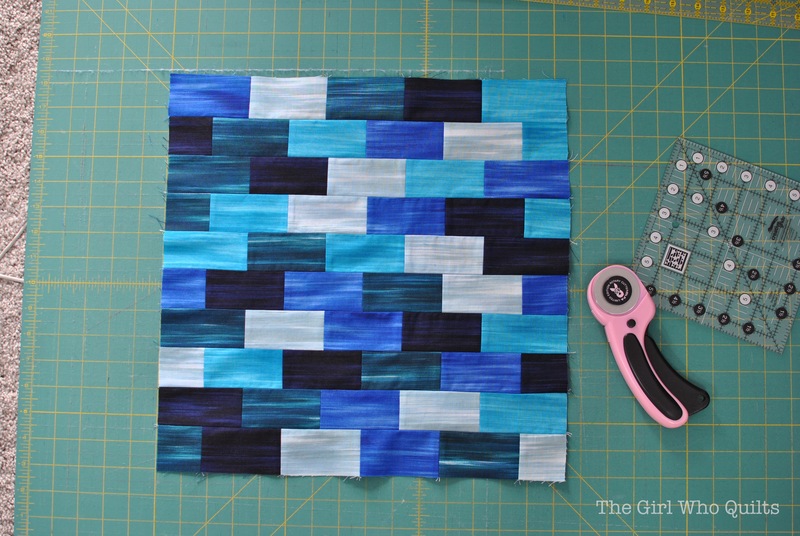 The blocks could also be sewn up to create a great quilt! So, let's get started! 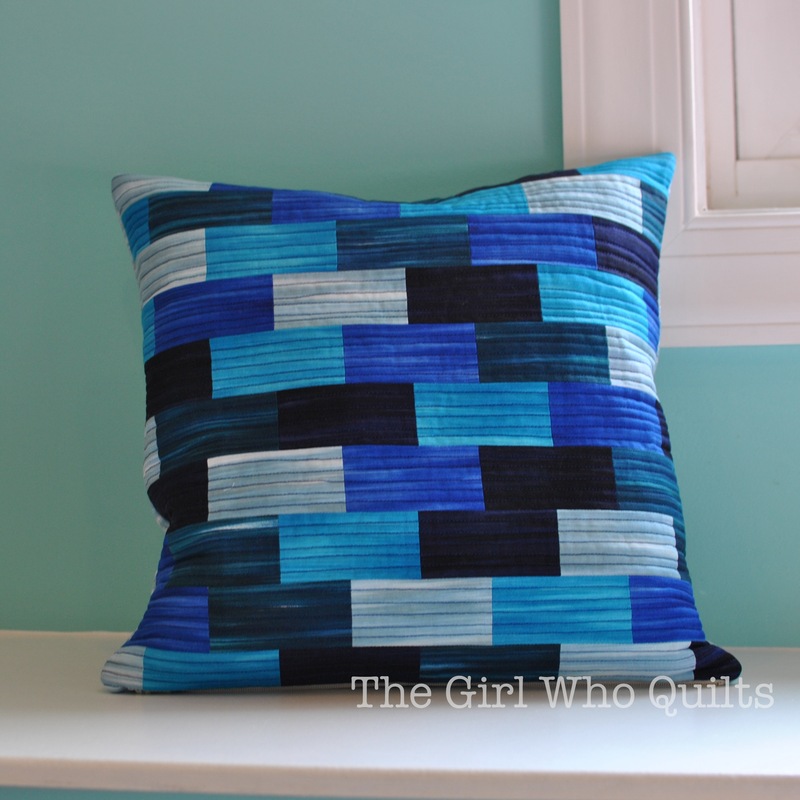 *This tutorial actually makes a 14 1/2" x 14 1/2" finished pillow. I used an older 16" pillow form that had lost its shape. The pillow form no longer filled a 16" x 16" cover, but works great for this project! Another option is to buy a less expensive pillow form, they typically aren't as full as the higher priced ones. Cut a 3 1/2" x WOF strip of each 1/8 yd cut. Cut the fat quarter for the pillow back to 18" x 18". 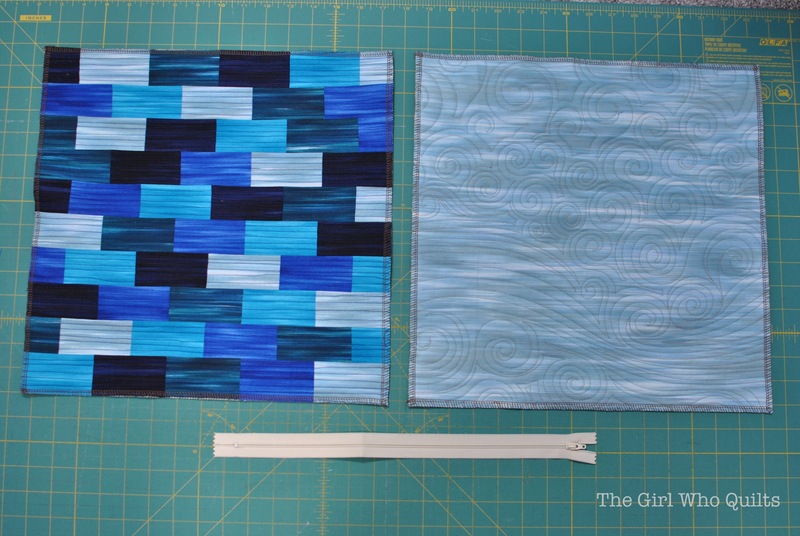 Cut the 1/2 yard of lining into 2 - 18" x 18" squares. Cut 2 pieces measuring 2" x 2". Row A (top row in photo): Piece 4 of the 3 1/2" x 2" pieces together. 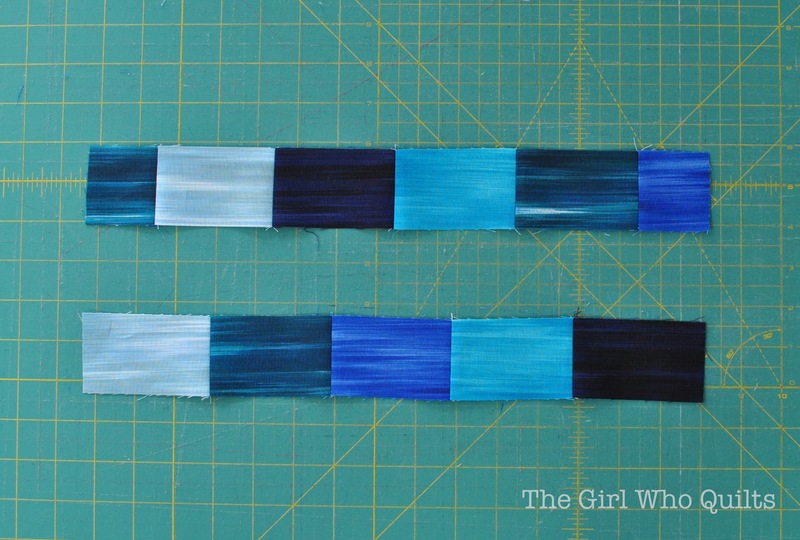 Sew a 2" x 2" piece to each end of the strip to create a 15 1/2" x 2" strip. Piece 5 of row A. Row B (bottom row in photo): Piece 5 of the 3 1/2" x 2" pieces to create a 15 1/2" x 2" strip. 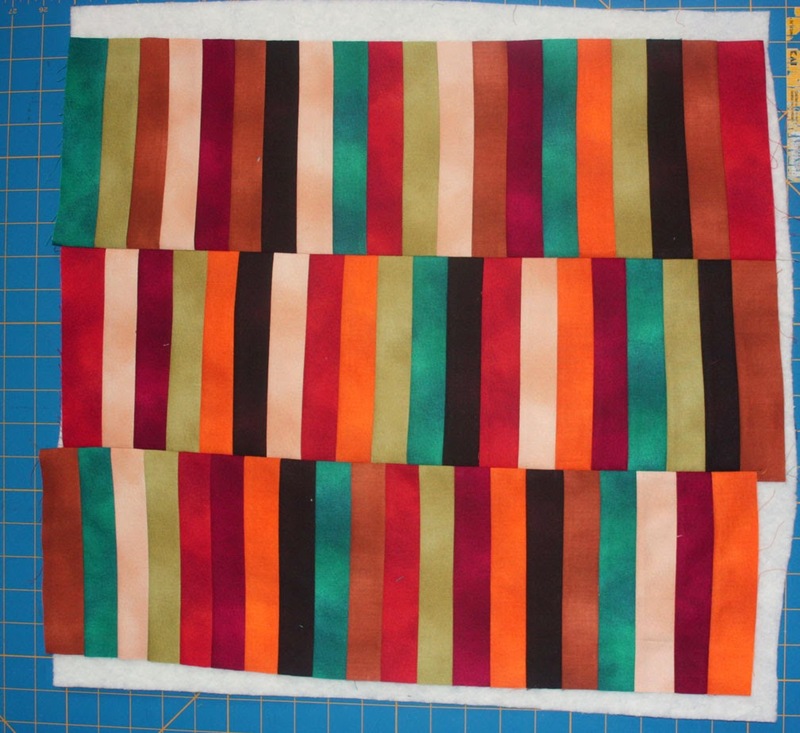 Piece 5 of row B.
Sew the 10 strips together, alternating rows A and B to create a 15 1/2" x 15 1/2" pillow front. Layer the pillow front with a 18" x 18" piece of batting and lining. Repeat for the pillow back. Quilt as desired and square the pieces to 15" x 15". At this point I like to serge or zig zag the raw edges of the pillow front and back. 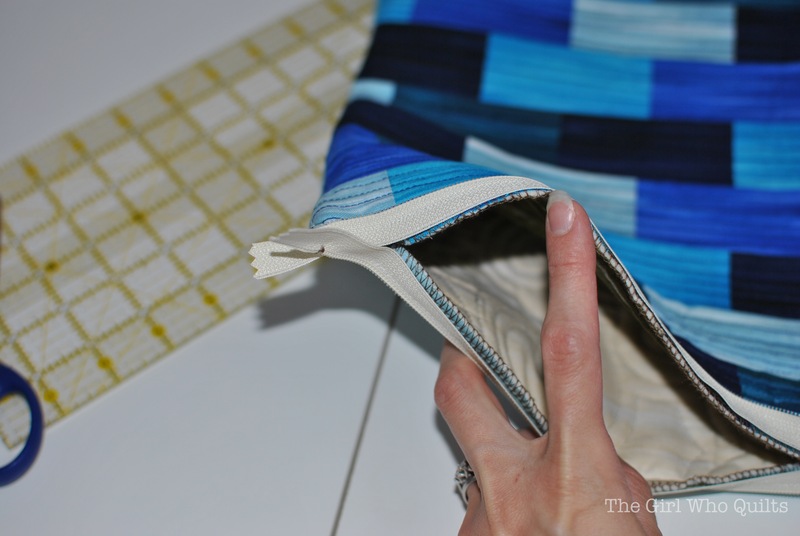 Lay the zipper on the bottom edge of the pillow back, with one end of the zipper tape at the pillow corner. Pin the zipper in place and sew using a 1/4" seam. I like to start my stitching at the metal zipper stop, and sew towards the zipper pull. I sew down as close as my presser foot will allow me to get to the zipper pull. 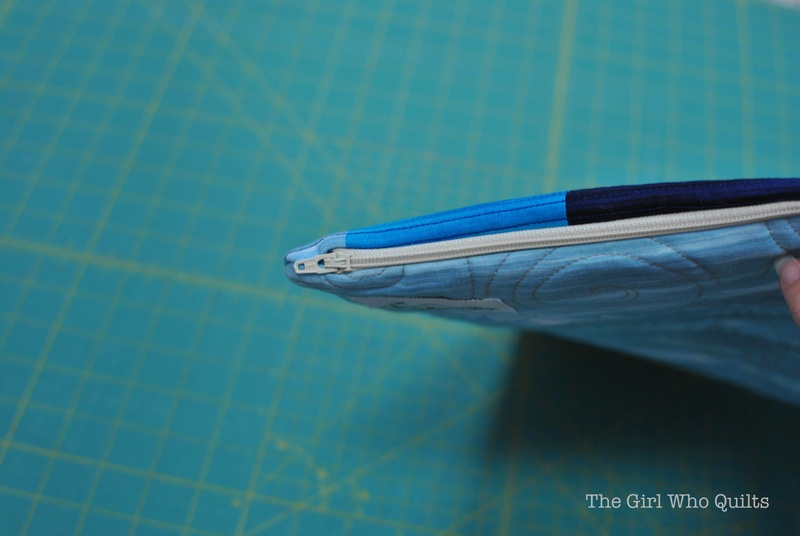 Lay the other end of the zipper tape along the bottom edge of the pillow front. Again align one end of the zipper tape at the pillow corner. Pin the zipper in place and sew using a 1/4" seam. You may wish to open the zipper before sewing. Open the zipper at least half way. Fold the pillow so right sides are together. Pin around the sides and top of the pillow. At the bottom corners, pull the zipper ends out of the way. 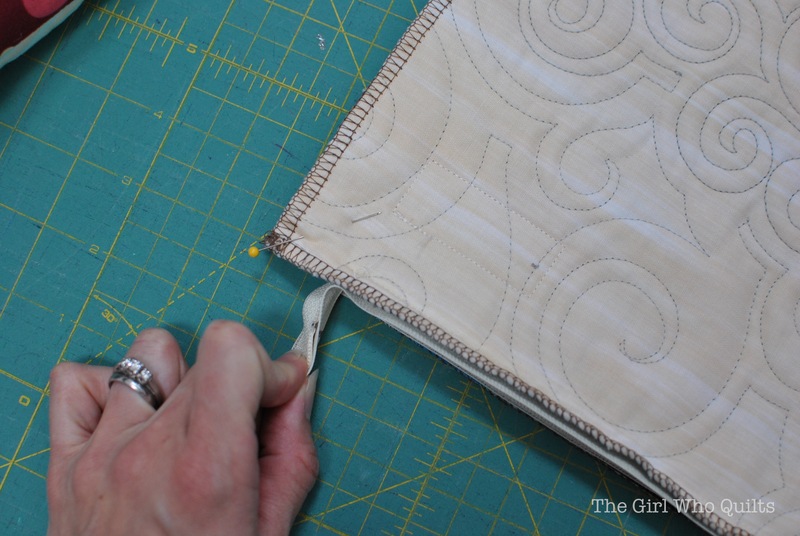 Sew around the sides and top of the pillow. On the bottom edge, stitch from the corner towards the zipper. Don't worry about getting too close to the zipper, just get as close as your presser foot will allow. The red arrows show the gap in stitching. Turn the pillow right side out and gently push out the corners. The zipper tape may be sticking out right now. Just tuck the ends into the pillow before zipping it closed! Stuff the pillow form into the case, and you're done! 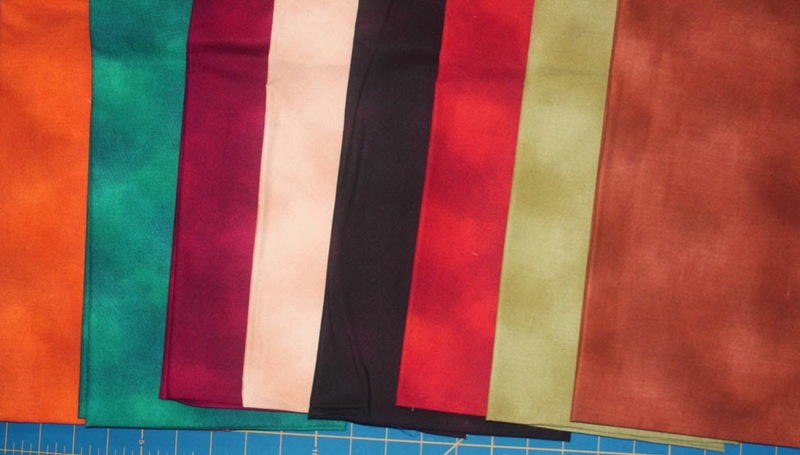 Leave a comment below or on Nikki's blog for a chance to win a fat quarter bundle of Fleurish! Simply sign up to follow the Benartex blog (use the email or Bloglovin' buttons in the right hand side bar and leave a comment letting us know that you do). For a second chance to win, follow Benartex's Sew Interesting page on Facebook and leave a comment here letting us know you do. The giveaway is open through Tuesday, September 2 at 11:59 pm EST and the winner's name will be randomly selected and announced next week. Be sure to check out the other tutorials we've featured all week long! Welcome to Day 3 of our Blenders Blog Hop! Today we're featuring tutorials for two pillows made by the Benartex Blog Design Team using the gorgeous Blush collection. These almost solids have a rich depth from subtle shading, giving them a little extra sparkle than a basic solid fabric. Don't miss the information for entering the giveaway to win a bundle of Blush at the end of this post! 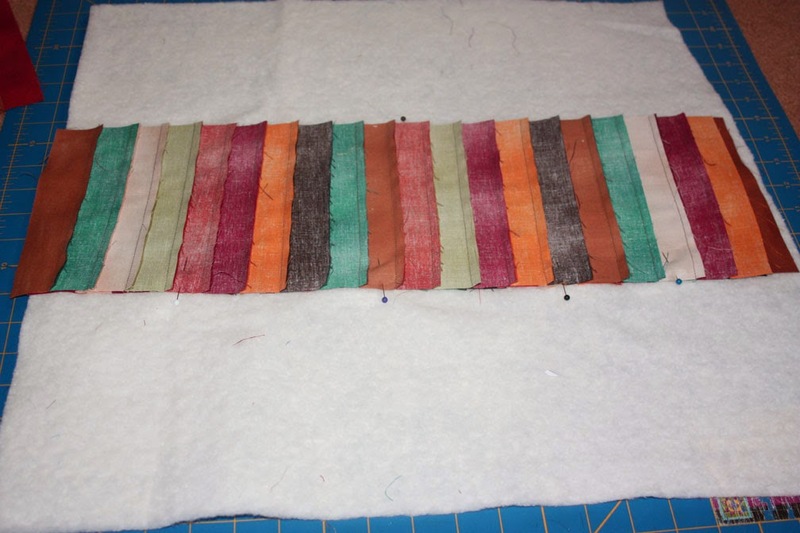 Step 2: Sew the 1-1/2" x 7" strips together lengthwise into pairs. 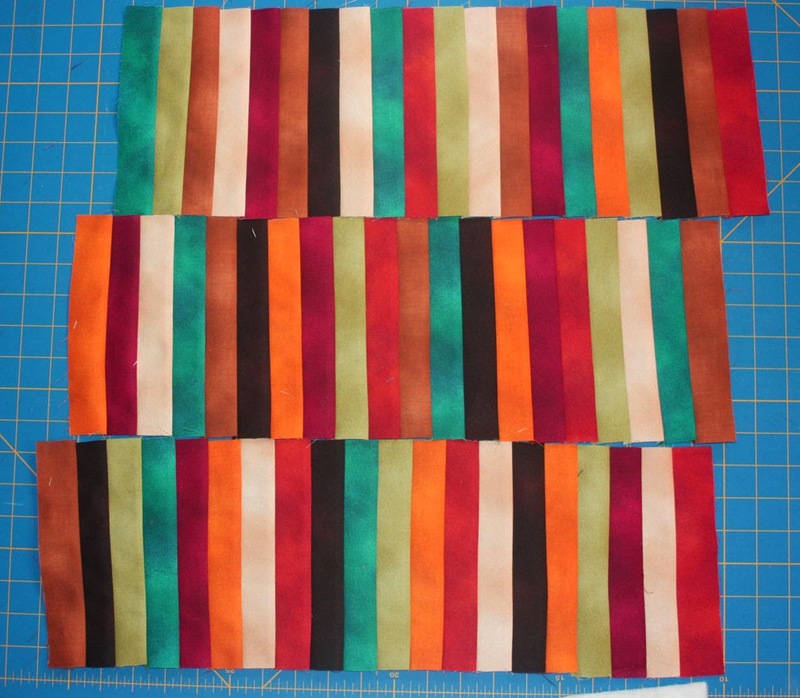 Step 3: Sew pairs together to create three units of 20 strips each. 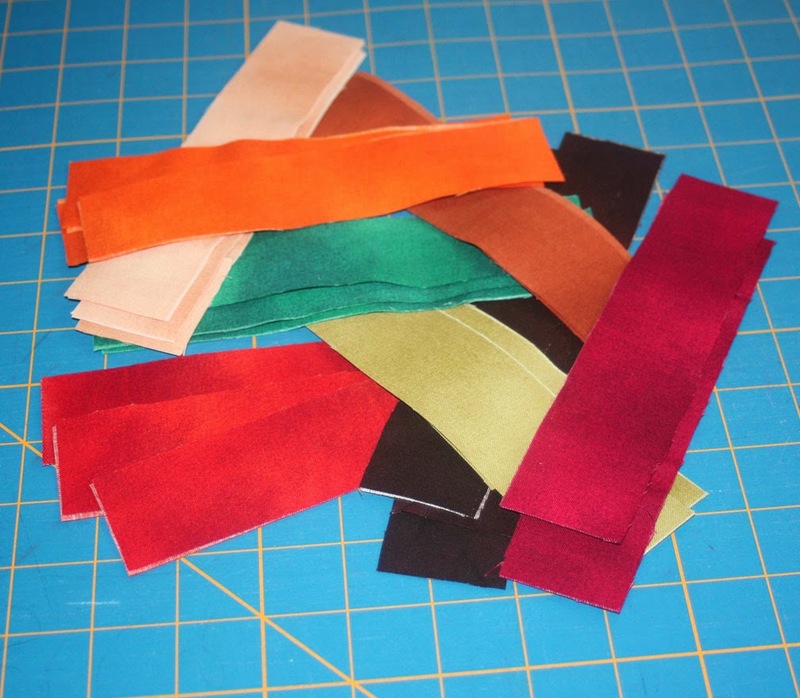 Note: You can sew colored strips together randomly or plan out color placement in advance--your choice! Trim units to measure 6-1/2" wide. Lay out the units together until you like how they look. The units are longer than needed so you can shift as desired and as you see below. We chose to have the units line up randomly rather than matching seams--again, your choice. Step 4: Use pins to mark the placement of the three units in relation to each other. Layer the middle unit centered on the 20" batting square. Layer a side unit on top, matching the pins for alignment. 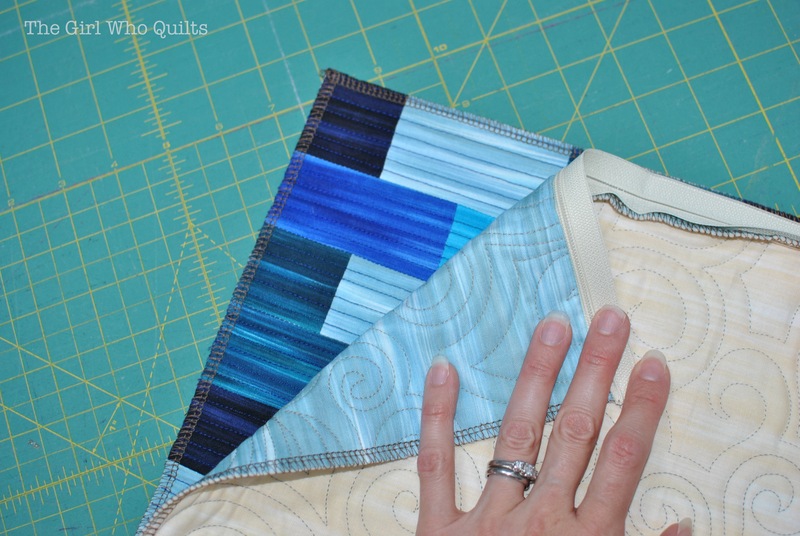 Pin the raw edges you'll be sewing together to each other and the batting to create a quilt as you go pillow top. Sew using a 1/4" seam allowance and press open. Step 5: Sew the remaining side unit on in the same manner. Step 6: Trim and square up the pillow top and batting to measure 18-1/2" square. Step 7: Fold and press one long edge of each 13" x 18-1/2" backing piece over 1/4" and 1/4" again to create a nice finished hemmed edge. Topstitch. Step 8: Layer the pillow top right side up and layer the two backing pieces on top right side down, matching raw edges. The long hemmed edges will overlap in the middle of the pillow. 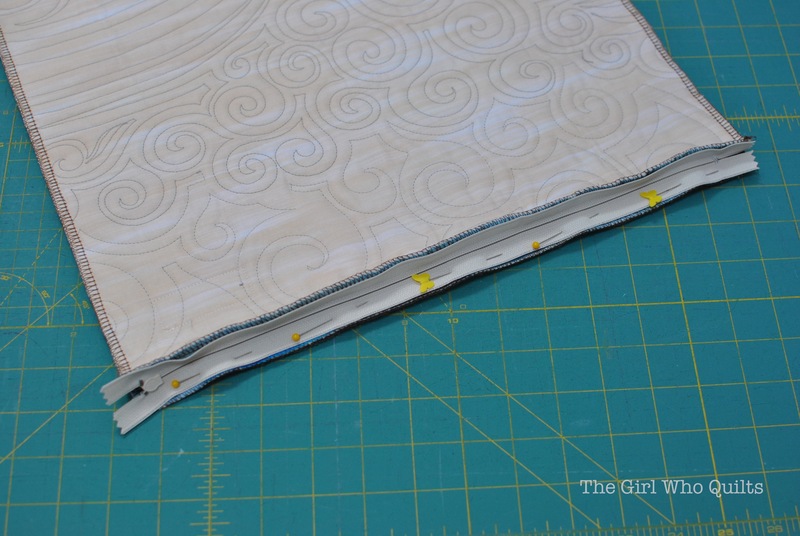 Pin layers together and sew around the outer edge using a 1/4" seam allowance. Step 9: Turn right side out and stuff with the pillow insert. 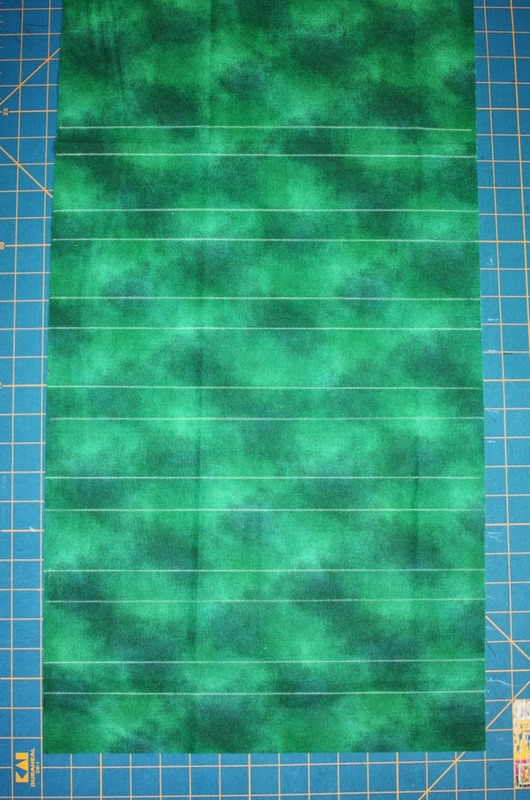 Step 1: Starting 1-1/2" from a short end of the 15" x 24" teal piece, begin marking lines. Mark a second line 1" from the first line. Mark a third line 2" from the second line. Continue marking lines, alternating between 1" and 2" apart as you see in the photo. Mark 7 pairs of lines. Step 2: Mark a line centered between each pair of lines that were previously marked 1" apart. To create each pleat, fold the fabric wrong sides together so the 1" lines meet up and the fold line is on the newly drawn centered line. This will create 1/2" pleats. 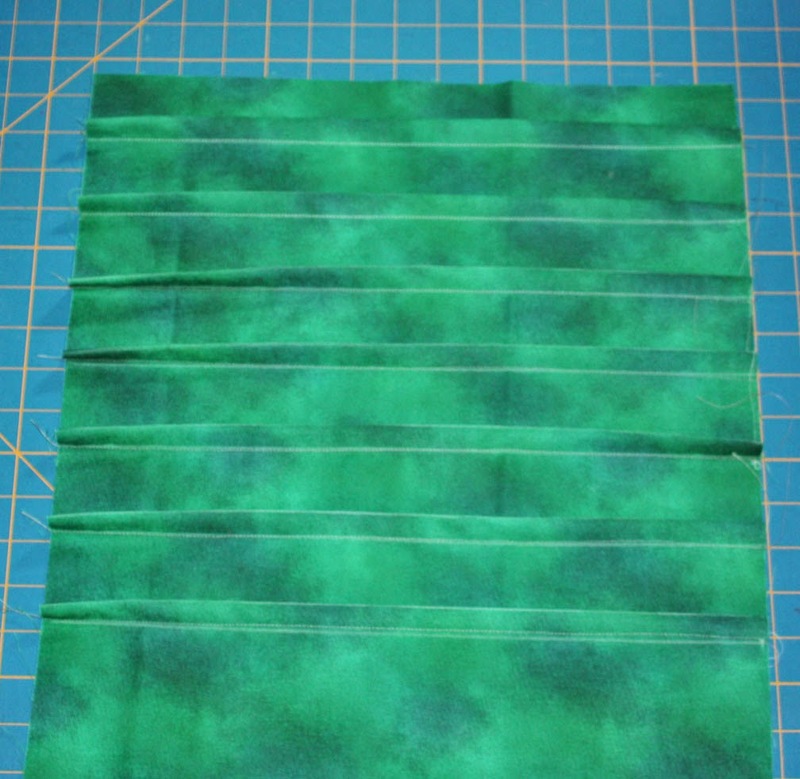 Step 3: Sew along the 1" chalk lines to create each pleat. Step 4: Sew all the pleats. Step 5: Trim pleated piece to measure 14-1/2" square. 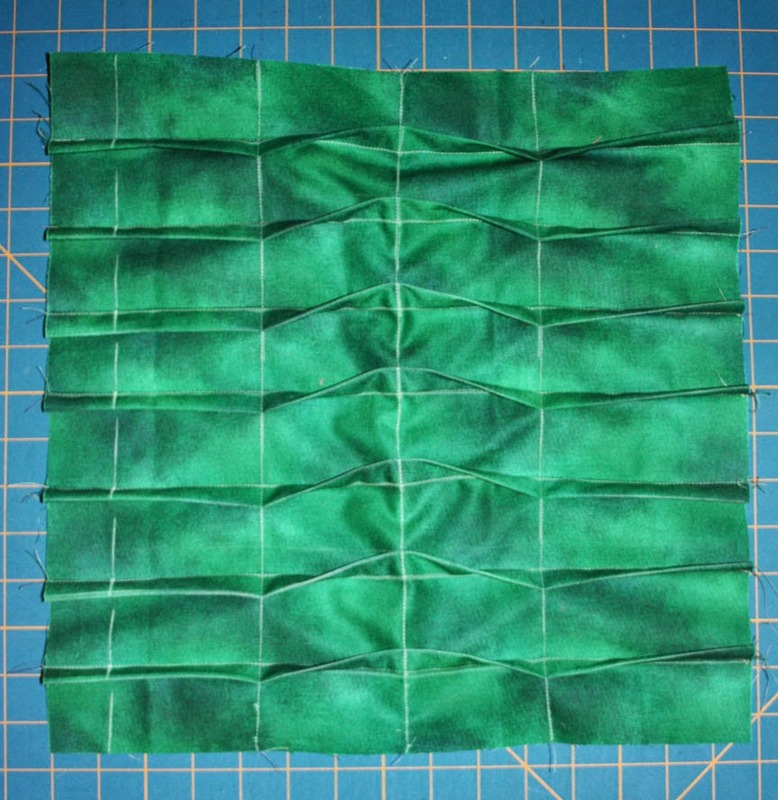 Draw a chalk line down the center of the pleated square, perpendicular to the pleats. 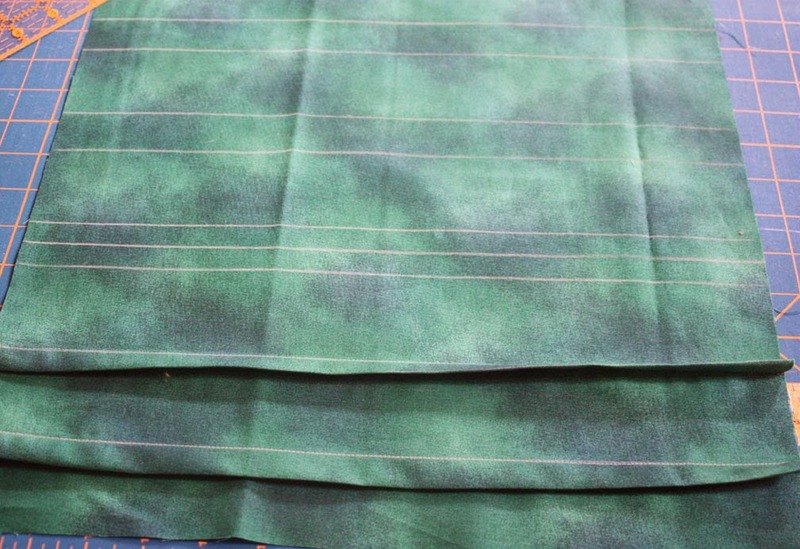 Step 6: Stitch along the marked line with all pleats folded in the same direction. Measure and draw lines 3" out from the center line and stitch, making sure pleats are folded in the opposite direction from the center line. Step 7: Repeat on each side, 3" out from the second set of lines, folding the pleats in the same direction as for the center line. 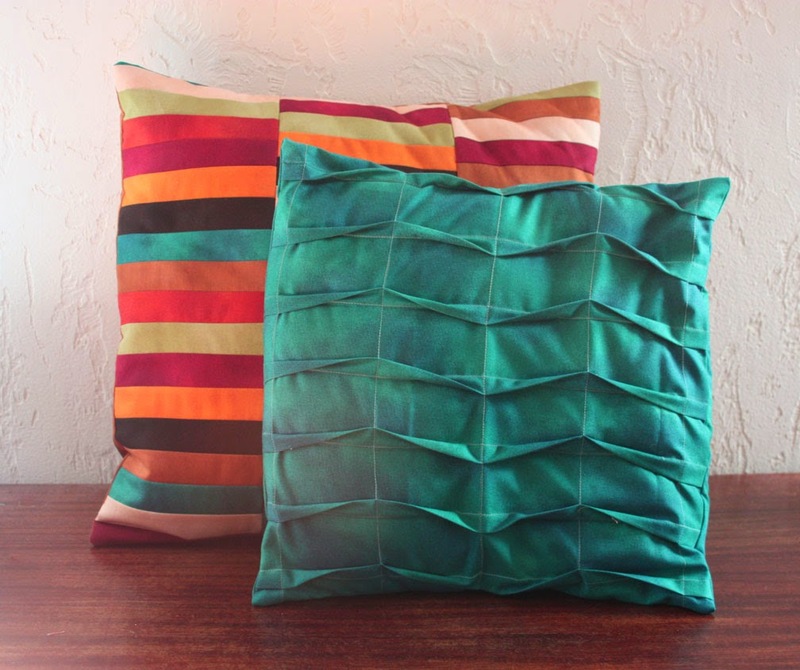 Step 8: Create two hemmed back pieces just like for the Strippy Pillow using the two 10" x 14-1/2" teal pieces. Assemble the pillow in the same manner. Voila! 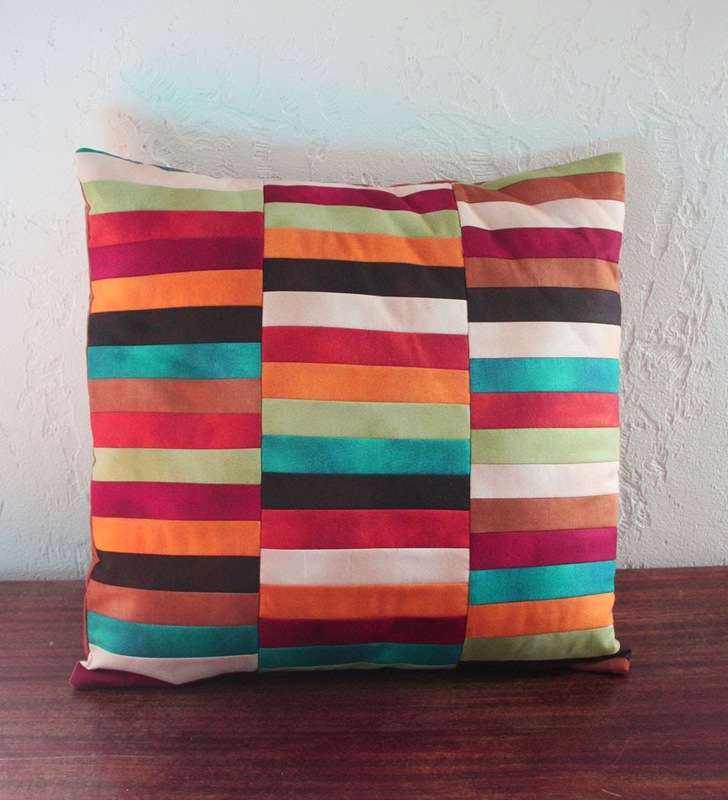 Two new pillows to freshen up your couch! Would you like to win a fat quarter bundle of the Blush line? It’s easy! Simply sign up to follow our blog and leave a comment on this post letting us know that you did. For a second chance to win, follow Benartex’s Sew Interesting page on Facebook and leave another comment here letting us know you did. The giveaway is open through Monday, September 1 at 11:59 pm EST and the winner’s name will be randomly selected and announced here next week! Be sure to check out the other tutorials we'll be featuring all week long! Welcome to Day 2 of our Blenders Blog Hop! 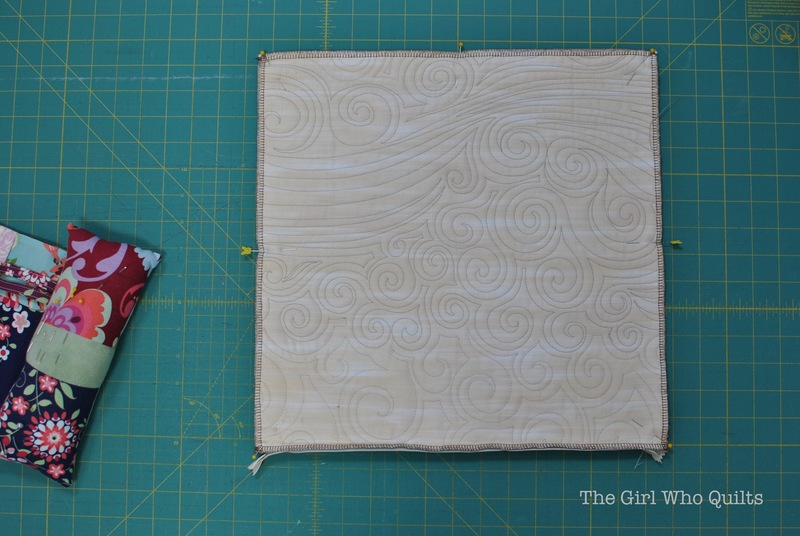 Today Caila from CailaMade will show you how to make an easy fold over wallet using the Burlap fabrics. 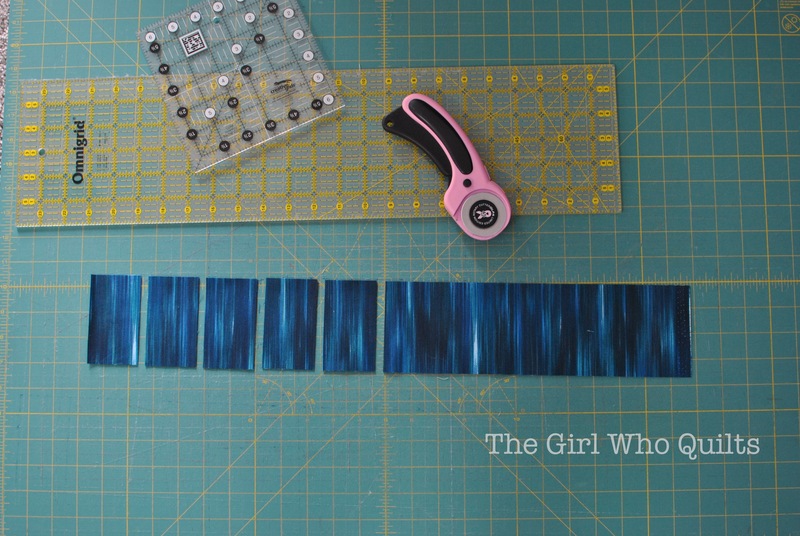 Great texture for a wallet, and we love the colors she chose! Check out her tutorial and then find out how you can win a bundle of Burlap fabrics for yourself at the bottom of this post! Hello Benartex readers! 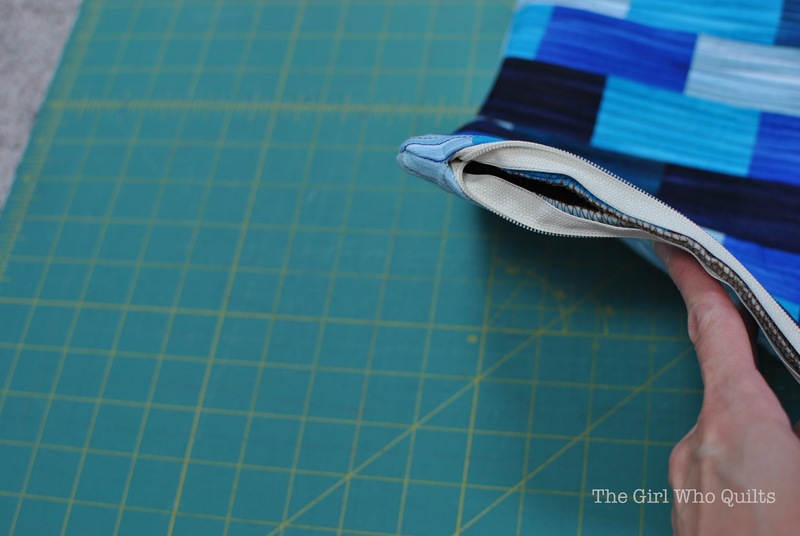 I'm Caila from the sewing blog, CailaMade, here to show you how to sew this awesome boy's wallet! My oldest son is about to start 2nd grade, and he needed somewhere to keep his (occasional) lunch money, so I whipped up this wallet and gave him a beginning-of-the-year gift that made him the happiest kid on the playground. Read on for the full instructions! If you'd like to see more of my sewing tutorials, and my new girls' dress pattern (The Desert Rose), head on over and check out my blog. I'd love to see you there! I used the following Benartex Burlap cotton prints for this wallet. I love the visual texture on these fabrics! They give the appearance of burlap but are printed on soft quilting cotton. They are both manly and modern, with just enough of a casual feel to compliment this beachy wallet. 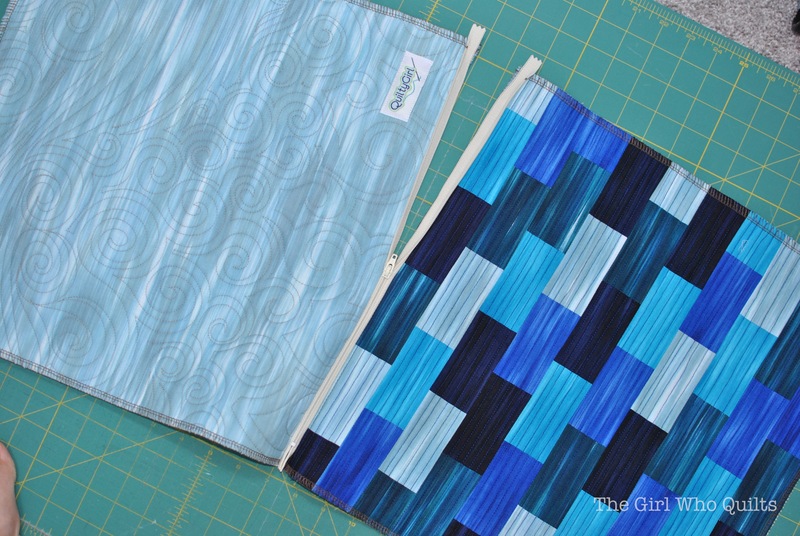 Pellon 808 Craft-fuse (but any mid-to-heavy weight fusible interfacing will work). Step One: cut the pieces You should have one outer piece, one lining, and four pockets. Fold the lining in half so that the wrong sides are facing. You should now have a rectangle measuring 9 ¾” by 4” with a folded top edge and a raw bottom edge. Stitch along the top edge, approximately 1/16" from the fold (not pictured). Step Two: prepare the card pockets. Pull out your four card pockets of the same size (4 ¾” by 4 ¾”). Pick two squares for top pockets, and two for bottom pockets. (I’m sorry about the sudden change in fabric. The pockets below were used in my second wallet and I had improved the process by that point). 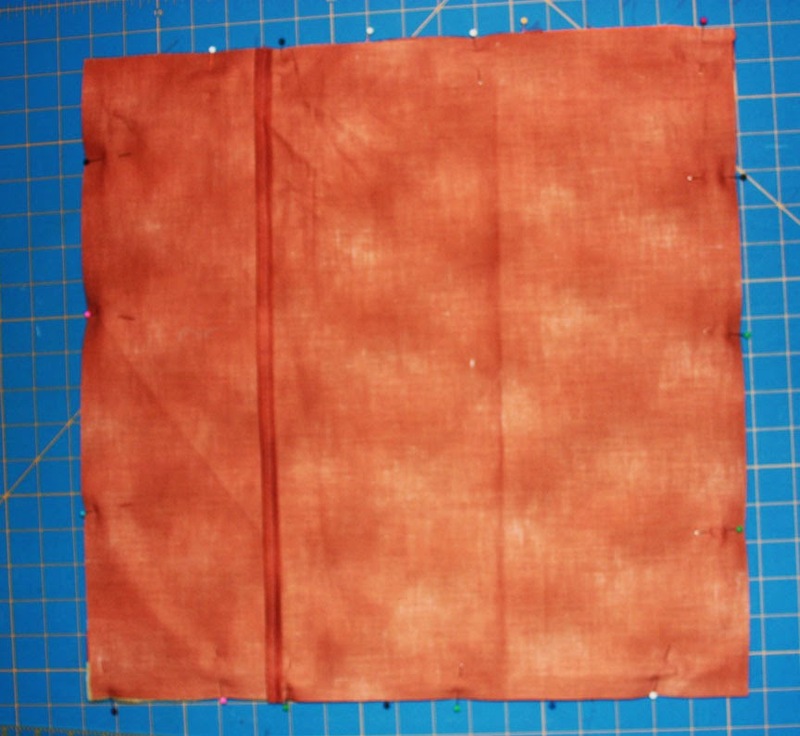 To make the bottom pockets, fold the fabric in half with right sides together and press. 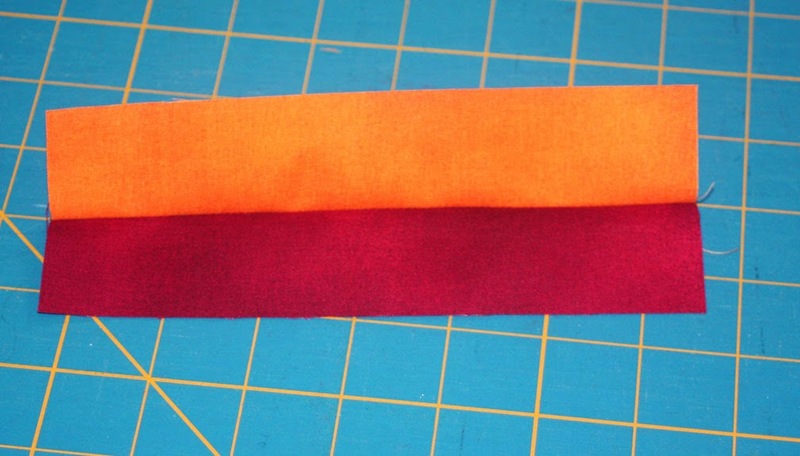 Using a ¼” seam allowance, sew along the RIGHT side of one pocket and the LEFT side of the other. Turn the pocket right side out and press. Topstitch along the top folded edge as close to the fold as possible (topstitching not pictured). To make the top pockets, fold the pockets in half right sides together and press. 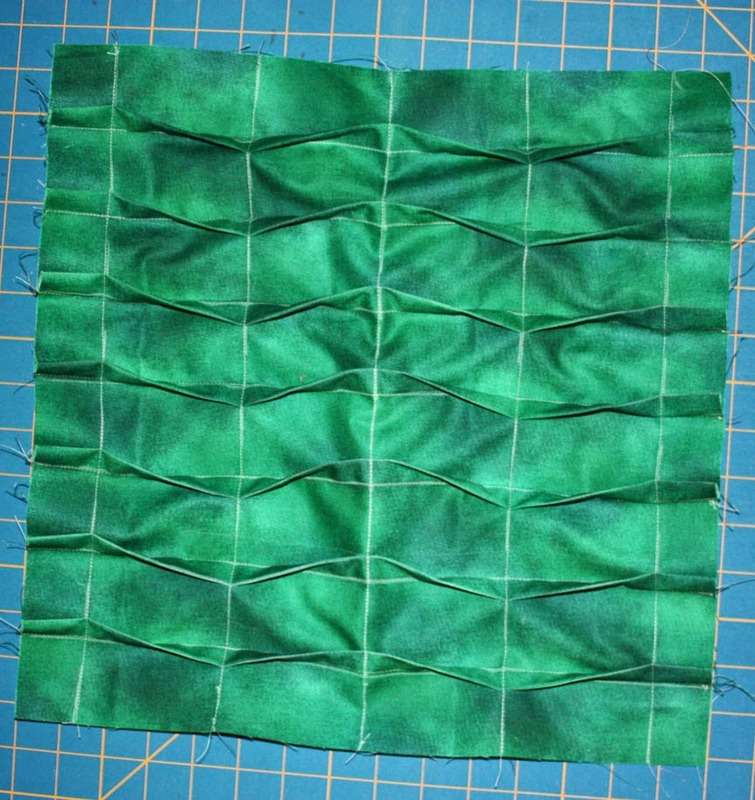 Using a ¼” seam allowance, stitch along the RIGHT side and bottom of one and the LEFT side and bottom of the other. Clip the corners and turn pockets right side out. Use a dull object like a pencil or chop sticks to push out the corners. Press well. Now topstitch along the top edge, as close to the edge as possible. You should now have four pockets prepared for the wallet, all topstitched. Set aside for later. 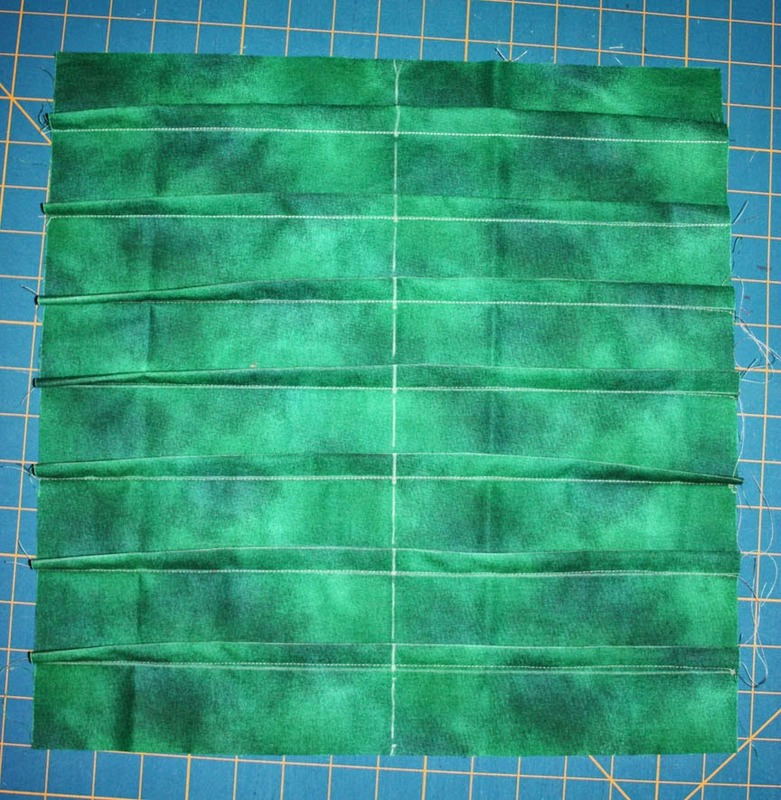 Fold the outer fabric over the interfacing so the wrong sides are facing. Press the fold so it is nice and crisp. Open up your lining for the following steps. Step Four: add the pockets to the lining Place the top pockets ¾” below the top of the lining and line up their raw sides with the raw sides of the lining. There should be an approximately 1/2" gap between the pockets on the lining. Make sure the raw edge is facing out and not toward the middle of the wallet. Open the lining, then pin your top pocket pieces in place. With the lining open, stitch the bottom only of the top pocket to the lining, using a 1/8" seam allowance (not pictured). Now place the additional two pockets below the top edge of the attached pockets by 3/4" and pin. Step Five: assemble the wallet Place your outer fabric on the table so the side which has been interfaced is on top. Place the lining on top of this piece with the pockets facing down. The interfaced side of the outer fabric should be facing the pockets of your lining piece. Pin these together along the sides and bottom. 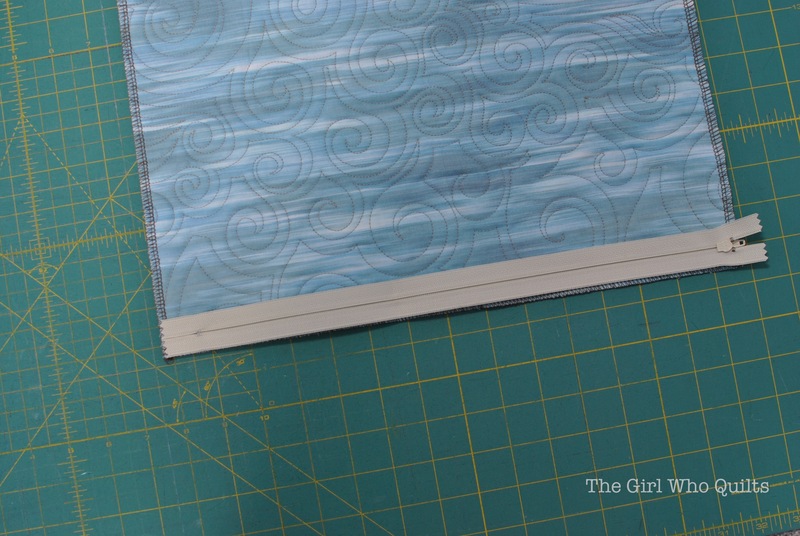 Stitch the outer edge (sides and bottom ONLY) with a 3/8” seam allowance. 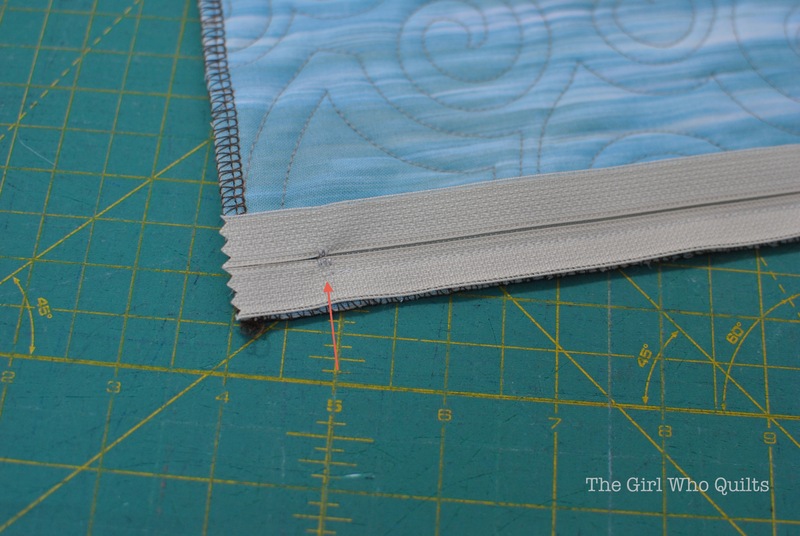 Trim the seam allowance down to 1/8” and carefully clip the corners. Make sure not to clip through any stitches. Turn the wallet right side out and press well. The corners may need some extra pressing in order to lie flat. Topstitch around the sides and bottom of the wallet about 1/8” or 1/16” from the edge. 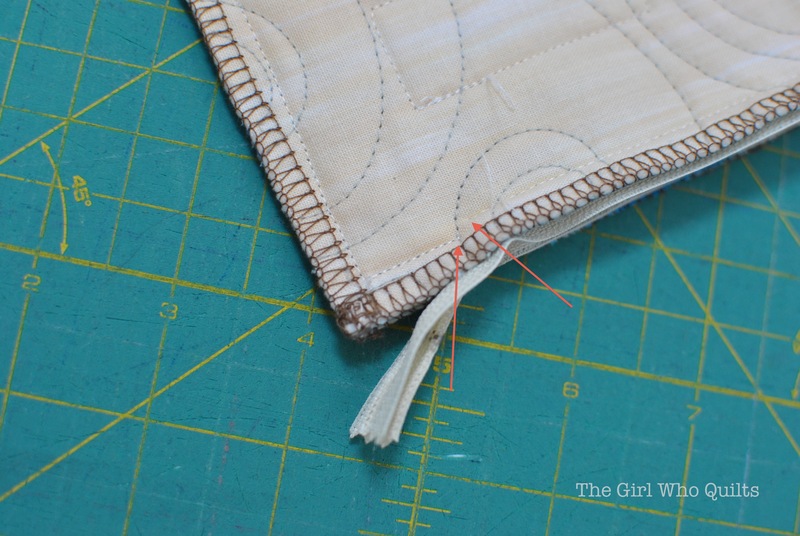 The topstitching will be most visible from the outside of the wallet, so I suggest topstitching with the outside facing up. You’re done! That was fun, huh? I love making these wallets! They make great gifts for the little men (or ladies) in your life. Thanks so much for reading today. If you enjoyed this tutorial, please share with your friends and family! I'd also LOVE to see what you make with these instructions. Head over to my CailaMade Inspired Sewing group on Facebook to share your creations and say hi. I'd love to "meet" you there. And don't forget to stop by my sewing blog, CailaMade, for more tutorials, pattern reviews, and pictures of my darling kiddos. Have a great day and happy sewing! Thanks Caila! Would you like to win a fat quarter bundle of the Burlap line? It’s easy! 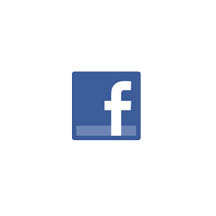 Simply sign up to follow our blog and leave a comment on this post letting us know that you did. For a second chance to win, follow Benartex’s Sew Interesting page on Facebook and leave another comment here letting us know you did. The giveaway is open through Sunday, August 31 at 11:59 pm EST and the winner’s name will be randomly selected and announced here next week!